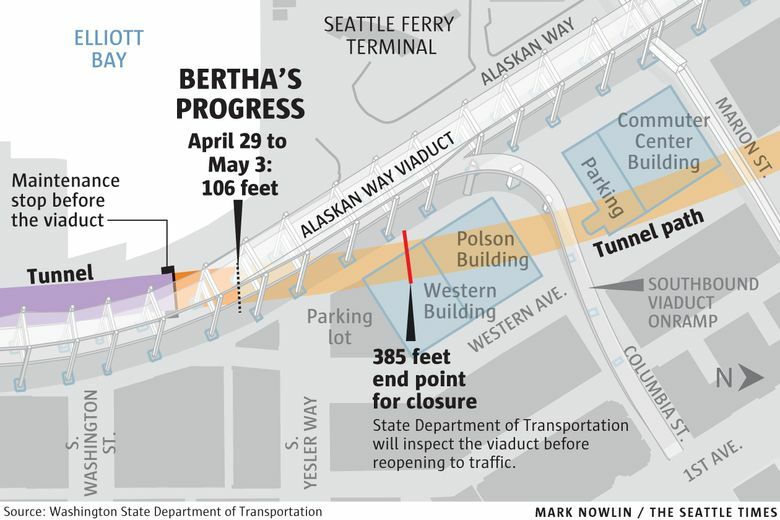 Bertha has advanced more than 100 feet since the morning of April 29, when the viaduct was closed to traffic as a safety precaution. The shutdown is estimated to last two weeks. Tunnel-boring machine Bertha is gaining speed as it digs under the Alaskan Way Viaduct, the most suspenseful phase of its journey from Sodo to South Lake Union. Contractors have taken the drill 117 feet and set 17 concrete rings since Friday morning, when the viaduct was closed to traffic, Chris Dixon, project manager for Seattle Tunnel Partners (STP), said late Tuesday morning. Every 6½ feet, the machine pauses so crews can fasten 10 concrete arcs to make the next ring of the highway tube. Three barge loads of dirt already have been shipped across Puget Sound to a quarry near Port Ludlow on Sunday night, and another is filling, Dixon said. Every turn of the cutter head brings the state closer to reopening the Alaskan Way Viaduct for traffic. As of 4 a.m. Tuesday, the machine has advanced 106 feet and built 16 rings since Friday morning, when the viaduct was closed as a safety precaution. Officials estimate the shutdown will last two weeks. Traffic is to resume on the viaduct once Bertha has drilled 385 feet, and it’s more than a quarter of the way there. The tunnel route bends diagonally from the waterfront toward downtown, and 385 feet is how far Bertha’s front end must go before it passes completely under the viaduct, leaving behind a solid tunnel. 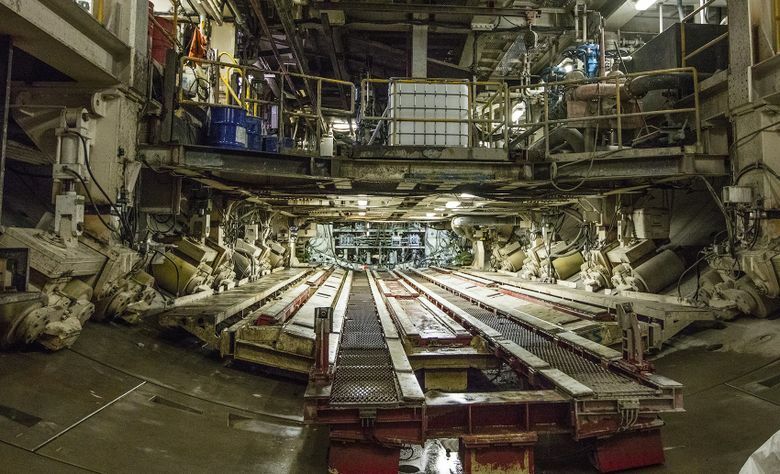 The fresh soil 80 feet down is mostly stable clay, and it even required some injections of foams and water so the muck will flow from the spinning disk into the conveyor system, Dixon said. That dry soil is a bit surprising, and it’s preferable to extreme groundwater. Sloppy soil can make it difficult to keep a consistent front-end pressure as Bertha pushes forward, and wet soil can be trickier to measure. Ideally, the soil takes on a texture like stiff oatmeal, especially at the so-called “plug” of firm muck where the soil enters a conveyor auger at the base of the machine. “As long as we can condition it properly, so we can control the pressures and temperatures so it will go through the machine as intended, we’re OK,” Dixon said. However, digging rates fluctuate, and state officials won’t predict whether Seattle Tunnel Partners will finish in the two-week estimate. “I think we’re kind of on target for where we hoped they would be at this point, as of Monday,” said Dave Sowers, deputy Highway 99 administrator for the Washington State Department of Transportation (WSDOT). Later, the machine will pass beneath the Columbia Street onramp to the southbound viaduct. But by then, Bertha will be so deep underground that no road closures are called for, Dixon said. Some days are better than others because minor repairs, such as unclogging grout nozzles and conveyor parts, often interrupt the push north. On Monday morning, for instance, a hydraulic part malfunctioned in the machine that lifts the arc-shaped segments of the tunnel tube, forcing crews to pause for repairs, Dixon said. The grind started slowly Friday as the machine emerged from a buried concrete block where it received scheduled maintenance. Bertha moved only 7 feet the first day. The viaduct carries 90,000 vehicles and 30,000 transit riders each day. The state closed it both as a safety precaution and so that sensitive measurements, such as from lasers and satellite data, would be more accurate. Hundreds of measuring markers and devices help WSDOT detect any potential sinking of the viaduct, which sits atop weak fill soil. Tons of grout are continually sprayed out the rear of Bertha to fill an 8-inch gap that surrounds the cylindrical machine. A gap exists because the cutting disk is wider in diameter than the Highway 99 tunnel rings being set behind it. Meanwhile, buried gauges called extensometers check for movement. Crews are frequently checking four behind the cutter and one in front. One of those moved in January, prompting an urgent meeting with STP, the state and oversight contractors who thought the reading was an anomaly until a large sinkhole formed Jan. 12. Drilling was suspended until contractors issued a restart plan, with stricter protocols for soil monitoring, in late February. Barring further problems, contractors estimate the four-lane, tolled tube will open for traffic in spring 2018. The $1.4?billion contract calls for all buildings, utilities and roads over the tunnel to be monitored until the job is finished. That would reduce the risk of delayed sinking, such as a sinkhole discovered Sunday next to a home in the Roosevelt neighborhood, where the University-Northgate Sound Transit light-rail tunnel was excavated last fall. A similar delayed sinkhole broke open near the Beacon Hill Station in 2009.